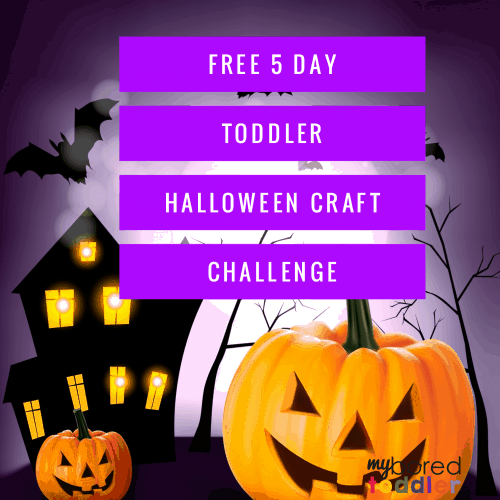 Thank you for joining in our 5 day Halloween Craft Challenge for Toddlers! If you haven’t already signed up you can do that HERE. The purpose of this challenge is to encourage you to get crafty with your toddler! The crafts will be SIMPLE and INEXPENSIVE, I promise. One of the reasons I created these kinds of challenges is that the feedback I was receiving was that all of the fancy Pinterest activities were great, but what people really wanted were easy activities that they could do with little planning. We will start our Challenge on MONDAY 15th OCTOBER and you will receive an email each day with the new activity. To ensure you have enough time to get ready, I’ve put together a list of everything you will need. If you’re an Amazon shopper you can find the entire list HERE in my Amazon store to make for easier shopping. Colored construction paper – a pack like THIS is great to keep in your craft box. We will be needing green, orange and black. Craft gift bags – a medium size works best as we’ll be making treat bags. Halloween stickers – any kind is fine, but the larger foam stickers like THESE are better. If you have any questions ust shout out in our Facebook Group. In the meantime you can find a huge collection of Halloween activities HERE. If you’re still focusing on FALL – they’re all HERE and our Spring Activities can be found HERE.